Clan MacTavish is an ancient Scottish Highland Clan with origins in the period known as the high middle ages. Clan MacTavish history has roots tracing back to the early royal families of Ireland and the Dal Riada settlements in the Pictish world, which later became known as the Coastal Highlands of Western Scotland. The MacTavish families and septs share a rich heritage documented in the early history of Scottish Clans, land holdings, and migrations. The name MacTavish stems from Taus Coir, (Tammis) a son born to Gillespic and a daughter of Sween the Red, Lord and Toisech (meaning leader, Chief) of Castle Sween and of Knapdale, in the last half of the 11th century. Clan MacTavish was brought out of a 200-year dormancy through the matriculation of the late Chief Dugald MacTavish of Dunardry in 1997 by the Court of Lord Lyon. 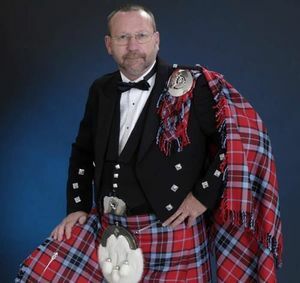 His son, Steven Edward Dugald MacTavish of Dunardry is the current Chief of Clan MacTavish, and a member of the Standing Council of Scottish Chiefs. "Since his matriculation in 1997, Chief Dugald MacTavish of Dunardry has not been satisfied with merely bringing back an ancient clan and chiefship, but with correcting a long standing injustice to the Clan MacTavish itself. Ironically, a subject long overlooked is addressed in the annuls of the Craignish Campbells, wherein it is anciently affirmed that the Clan MacTavish were independent, describing them as having repudiated any dependency on the Argyll Campbells. There are several official Clan MacTavish Tartans. Additionally some family surnames or septs, like Stephenson, may have official tartans. Here is a link to Clan MacTavish Tartans information from the official MacTavish Clan seannachie. Stephenson Tartan - Stephenson and/or Stevenson is a family surname or sept of Clan MacTavish.